Preheat oven to 350 degrees. Lightly grease a 9"x13" baking pan. 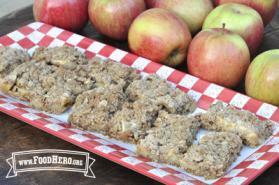 9 Comments for "Apple Bars"
This recipe has been updated to include raisins in order to meet nutrition criteria. It is a wonderful addition and we hope you all enjoy it! I would like to substitute dates as a sweetener and eliminate the refined sugar. Have you tried that? Maybe chopped and mixed with a little hot water would help hold the crumble together? I want to try it. Thanks for the recipe! A real favorite with five classes of 3rd and 4th graders! But, I agree that its a bit too sweet. With the brown sugar in the "crumble," it probably isn't necessary to sprinkle any sugar over the apples. It would be interesting to know what that would do to the nutrition information, especially the carbs. As written it isn't something I'd want to serve someone with diabetes, even as a small sample. I doubled the spices and added allspice. Very delicious, though crumbly. Not really a bar that holds together. If you don't have a 7" x 11" pan, a 9" x 9" pan works just fine. The recipe was a little sweet for our tastes. Sprinkling 2 tablespoons of sugar (instead of 1/4 cup) over the apples seemed right to us. Also a teaspoon of lemon juice perks up the fruit flavor. Yummy! We had 4 medium apples to use up which ended up meaning we raised the yield of the recipe 1/2 as that gave us 4.5 cups of sliced apples. Will make this again! Also used forks in place of a pastry cutter and added extra ground cloves. I think this is a good recipe. These are great, but are crumbly. Brought them to a teacher's lunch and they gobbled them up! These were so good! Definitely my favorite!! !